Marlee Enterprises is a unique source for all branding apparel and gifts. With our quality packaging, it would be our pleasure to either create a brand or help your business continue with their branding efforts. If your business doesn’t have a logo, allow us to help define yourself by creating one. We can help distinguish you by adding your trademark to all the outstanding items we offer. We, at Marlee Enterprises specialize in hallmarking restaurants, salons and spas, schools, sports teams and government agencies to become a recognizable name. 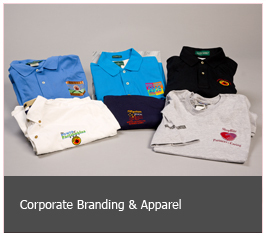 We may serve your trademark by embroidering it or silk screening it on garments and apparel. With the variety of items we offer, you can get as creative as you would like for your promo items! No minimums! Feel free to browse our apparel collection online.